Wonderful Time of Year- SALE! I absolutely love this time of year. From the snow covered streets, the aromas that fill your kitchen while baking for family and friends, laughter and happiness at holiday parties, to the smell of a vanilla cookie candle, twinkling lights, and celebration of life. This season is a season of giving whether that is to your best friend, Mother, Father, sibling, to a charity, or volunteering. There is nothing better then finding that perfect gift for someone, but if your like me as we grow older we find it harder to find that right gift at times! So for the next few weeks I am offering a perfect gift, DISCOUNTED, a gift of memories that will last a lifetime! What greater gift is there? It can be a family session for your Mom + Dad, or for your Brother or Sisters family, your own family, child, high school senior, wife, or anyone special to you! A gift of memories can be a gift for anyone! I am offering 25.00 of my sitting fee plus 15% off their ala carte print orders with session gift certificates on all orders placed by December 24th! Gift certificates can be used any time in 2015. Session fees start at 99.00 discounted, check out Cylinda BPhotography for more pricing information. 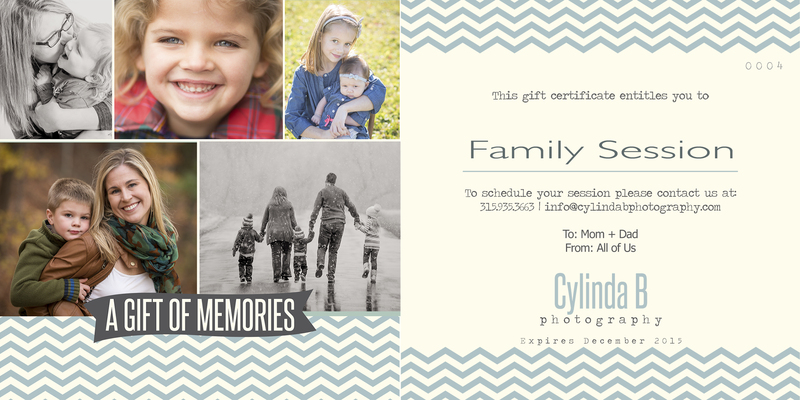 Contact me at info@cylindabphotography or by filling out the form below with any questions or to place your order! Credit cards accepted! (3%fee) Travel fee may be applied for sessions outside Syracuse if not redeemed on a scheduled travel date.